A swimmer enjoys the clear waters of the Lagoon Area. The Lagoon Area of the Hol Chan Marine Reserve consists chiefly of coarse to fine sand and seagrasses. It supports a wide variety of marine life, including sponges, small coral formations and various algae. The peaceful lagoon serves as a juvenile staging area for many species. The Lagoon Area is a feeding ground for many reef fishes. 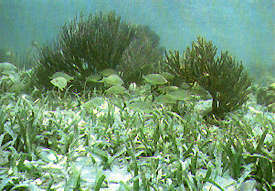 Fishes such as surgeon fish and parrotfish graze on the algae and seagrasses. You can also find turtles, manatees, conch and lobsters . This is a good area for a warm-up dive and for practicing your underwater photography techniques . While much less visited, the seagrass beds and mangrove roots of Zones B and C are well worth the visit if only for the novelty of what you might see. Seagrass beds are huge feeding grounds, and chances are that you will come upon huge sting rays feeding on the bottom, and schools of parrot fish and hogfish grazing on epiphytes growing on the seagrass. Though a very rare occurance, it is even possible to view manatee feeding in the grass beds. The best method for exploring the seagrass beds is to have your boat drop you off about 200 yards from the mangrove edges, or near some other feature that your guide knows about, and to slowly swim toward the mangrove or feature. Swim slow and swing your head from side to side. Much of the life in the grassbeds is well camoflauged and cryptic, so you will have to key in on movement - a conchshell dropping as the snail reacts to your movement, a lizardfish darting to the surface to feed and then back down motionless, a sailfin blenny flagging. It is even worth your while to stop for a few minutes motionless and let the surroundings come alive. This recently discovered dive site has been selected as one of the seven best "animal dives" in the Caribbean SKIN DIVER MAGAZINE. For years, local fishermen cleaned their catch just inside the reef, to the south of Hol Chan Cut and Ambergris Caye. The fishermen soon noticed that the offal from cleaning fish was attracting Nurse Sharks and several Southern Sting Rays. When the dive operators of San Pedro found out, they quickly investigated. What they found was a bonanza, and "Shark-Ray Alley" quickly became a very popular dive site. These creatures have a great tolerance for divers and snorkelers. The rays, which have a 'wing-span' of two to four feet, swim directly towards the divers, mouths often turned up hoping for a hand held tid bit to be placed near their mouths. Other have learned to swim in circles around the divers, as if performing for food. The docile Nurse Sharks average four to six feet in length and can be a bit more agressive than the sting rays.